Last weekend as we arrived at the movie theater to finally see The King’s Speech (all those Academy Awards were well-deserved! ), I noticed a big banner announcing “FARMER’S MARKET ~ SATURDAYS 8 AM – 12 PM”. I was elated – at last, a local farmer’s market that takes place on a day and time I can actually make! So there I was this weekend, back at the theater parking lot. My three-year-old sidekick’s primary goal: strawberries. They’re a year-round local specialty here in San Diego. We bought her a basket of the red beauties (along with onions, broccoli, kale, Swiss chard, leeks, fresh pasta, pesto, ciabatta, macarons, lime curd and fresh-rolled sushi – whew!) and took our big bag of local goodies home. 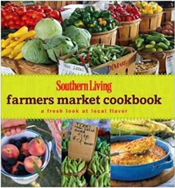 When we got home, right away I pulled out the Southern Living Farmer’s Market Cookbook, which the publisher sent to me a while back. It’s organized by season, so I flipped to the Spring section and found a whole bunch of creative recipes to use all the items that were now maxing out my fridge crisper. 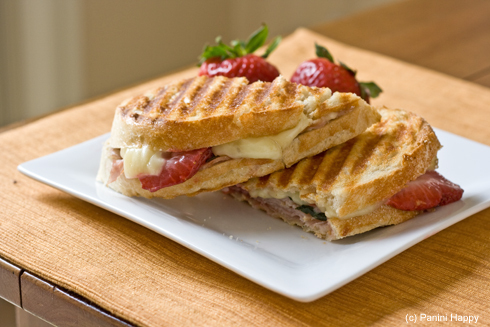 Not surprisingly, the Turkey, Strawberries & Brie Panini recipe caught my eye. This recipe turned out to be fabulous. The strawberries, once they were heated within the sandwich, took on a kind of jammy flavor which was perfect with the rich, creamy Brie. There are actually a whole lot of great flavors going on in this sandwich – fresh basil, smoked turkey breast and red pepper jelly are all in the mix as well. It’s a few more ingredients than I might normally choose but they all work so well together I wouldn’t dream of leaving any out. Trim and discard rind from Brie. Cut Brie into 1/2-inch-thick slices. 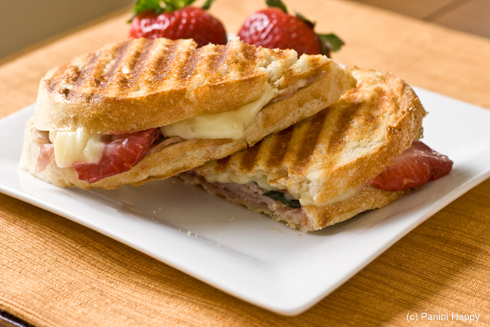 Layer 4 bread slices evenly with turkey, basil leaves, strawberries and Brie. Spread 1 1/2 teaspoons pepper jelly on 1 side of each remaining 4 bread slices; place bread slices, jelly sides down, on top of Brie. Brush sandwiches with melted butter. This sounds SO delicious! I can’t wait to use turkey, strawberries, and brie together! Julie @ Willow Bird Baking´s last blog post ..Three Safe-to-Eat Cookie Doughs- Chocolate Chip- Sugar- and Cake Batter! Love the combination of brie and strawberries here. It’s almost like dessert. Shaina´s last blog post ..National Nutrition Month- Very Hungry Caterpillar Giveaway! I loved the King’s Speech as well and finally saw it last week! Fabulous combination of ingredients for a panini! I love strawberries and brie together. This looks heavenly… I love sweet, fruity, brie sandwiches! I would’ve never come up with that combination on my own but OMGs does it sound fabulous. Yum! Delicious combination of flavours…and all of them fabulous on their own…I cant wait to try them together! Robin Sue´s last blog post ..45 More Days! Your cooking salon sounds like so much fun, Robin Sue – I hope all is going well with it! This looks so wonderful! It will no doubt be the next panini I make! I am loving this panini with jelly thing. It just makes the sandwich if you ask me 🙂 Thanks! I cant wait for strawberries and the opening of our farmer’s market. Spring had finally sprung and this sandwich is a great combo! oh, how i could tear into this right now. i eat brie by the wheel so any amounts of it in this panini would be totally acceptable. i should browse through that book! Oh Kathy – that looks so delicious!! !